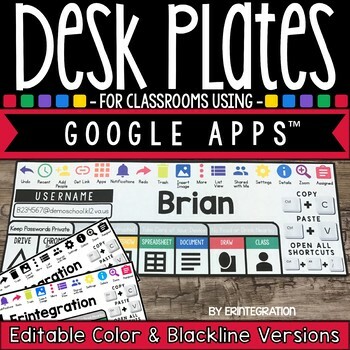 This editable reference desk plate / name tag is perfect for technology labs or classrooms using Google Classroom, Google Drive™, Google Slides or any part of the Google Apps for Education™ service on iPads™, PC, laptops, or Chromebooks™. 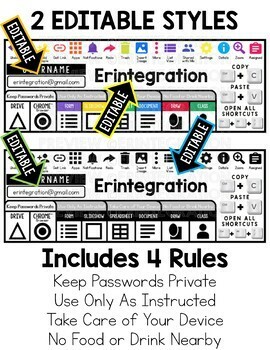 Desk plates can be edited in both Powerpoint and PDF. Easily type student names RIGHT in the Editable PDF or the Editable PPT and print as many as you need - just click, type, and print! Also includes an ink-friendly blackline version. ★ 34 page PDF - just click to type names using the font displayed in the thumbnail. 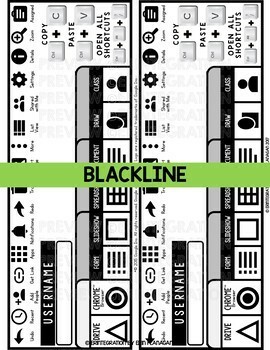 PDF includes both color and blackline versions. You can print more than 30. PDF also includes editing & printing instructions. ★ 1 PowerPoint file with each version if you prefer to add names that way using your own fonts. Each desk plate measures approximately 4x11 inches when printed. 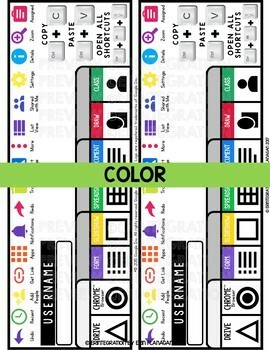 They look great laminated and taped to each desk or they will fit most commercial desk plate plastic sleeves. Google and Google Apps are trademarks of Google Inc. © 2015 Google Inc. All rights reserved. iPad and App Store are registered trademarks of Apple Inc. Erintegration is not affiliated with and has not been authorized, sponsored, or otherwise approved by Apple Inc or Google Inc.